How do you sell Cauliflower soup to a house full of people known for their epic aversion to the vegetable. "The recipe is from the same book last Friday's beef daube came from. Wasn't that the best braised meat you've had in a long time" I countered hoping that the power of association is strong enough to make them want to take the plunge into the soup! "That was beef stewed in wine for hours how does it relate to boiled cauliflower? DO you see any similarities because I don't" came the reply and in all fairness I get the point! "But I put bacon in it" I finally say exasperating.... "mmmm OK, I guess I'll give it a try! After all everything tastes better with bacon!!!" OK, I might have exaggerated a bit here, but more or less this is how it went down in the kitchen today. Cauliflower is not glamorous and not the easiest dish to sell, especially when it it quite sunny outside and no one is suffering from a stuffy nose and is in need of a soothing pottage. I for one, love cauliflower, in any version! Boiled and mashed up with a bit of lemon and herbs, roasted, oozing with cheese from the oven, even as a substitute for rice - the famous cauli-rice for those of you conversant in "Paleo talk". There was no way this pot of velvety, fragrant, white magic would go to waste. The challenge was to get the rest to try just a bit (I would never dare think of converting them to cauli-lovers) and in the end I managed just that. M-i-L had about half a bowl and declared it "quite good". Honestly I think there's going to be a long time until another head of cauliflower sees the insides of this kitchen! Adapted from Dorie Greenspan "Around my French Table"
Heat the olive oil into a large stock pot. Add the onions, garlic, half of the bacon cubes, thyme, salt and pepper. Stir well and then lower the heat, cover the pot and cook for about 20 minutes stirring often. Add the cauliflower into the pot and pour in the chicken stock. Increase heat until the liquid is starting to boil then reduce heat, cover and let it simmer gently for about 20 minutes (the cauliflower has to be very tender). In the meantime, heat a small pan and add the remaining bacon. Fry it for 10 - 15 minutes in low heat until it becomes crispy. When the soup is ready, purée it with an immersion blender until it becomes very smooth and velvety! Ladle into warm bowls and sprinkle them with bacon bits and thyme leaves. To see how other members of our group enjoyed this recipe visit the French Fridays with Dorie website. How could they not even want to try such a pretty, elegant soup?! ;) I have to admit, I'm not a big fan of cauliflower, and I thought this soup was just alright. But I did eat it! And yours looks so good that I wouldn't mind trying again! Well, it was their loos since they didn't try the soup. It was so good. Well, Maria, you gave it a go and tried your best. You enjoyed it, nonetheless. Thank goodness this soup is even better the next day and the next. 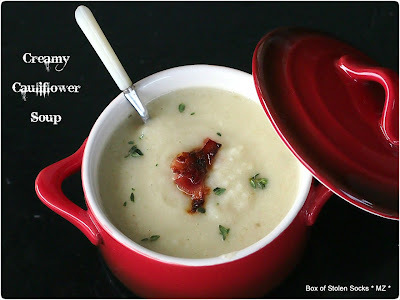 I happen to love cauliflower so I almost didn't feel that this soup was "cauliflowery" enough. Bacon bits are a good topping. I drizzled walnut oil on top and threw some toasted chopped walnuts over the top. It was delicious. This was surely a tough sell, but I found it incredibly good. That red pot is gorgeous! That and the bacon definitely makes it inviting. I liked it so much! I'm going to try the other versions as well!! LOL Diane!! Those damn cauli-hating genes are spread all over the world!!!!! 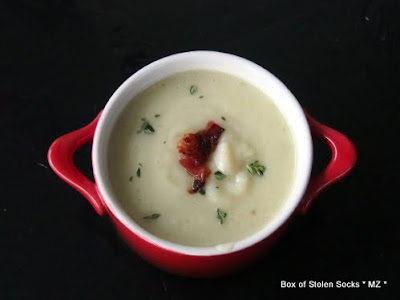 Maria, very pretty presentation of your Creamy Cauliflower Soup with bits of bacon and little thyme leaves - we really do enjoy cauliflower in any shape or from, so there was none left at our house! Thank you Andrea I really like cauliflower so I wasn't exactly crying when I was left with an almost full pot of this soup :) :) I enjoyed even more the next day! some grated swiss cheese. I was sorry that I had cut the recipe in half, hubby and I were looking for more. Thank you Nana! Some cheese would have been a great addition I agree!!! Yay leftovers!!! I was so happy to enjoy most of the soup for myself! And it actually tasted even better the next day!!! A fun post, Maria! I have a husband who wouldn’t touch this soup…but I knew that going into it so I only made half the recipe! Love your presentation in that beautiful red crock! And love the addition of bacon! Thanks Kathy! Fortunately my husband did not inherit the cauli-hating gene but unfortunately he is too far away to be able to enjoy this soup. I promised him to make it again sometime during Christmas vacation !!! Your soup looks gorgeous & I love the little crocks. Yum, this soup looks delicious! haha I always try to trick the picky eaters in my family with cauliflower "mashed potatoes" - I tell them that they are regular mashed potatoes so that they try them : ) Funny how quite a few like cauliflower when they don't know that they are eating it! This is so true Ashley! If you don't tell them what's in it they won't mind eating all those foods they "think" they hate! Thanks for stopping by! 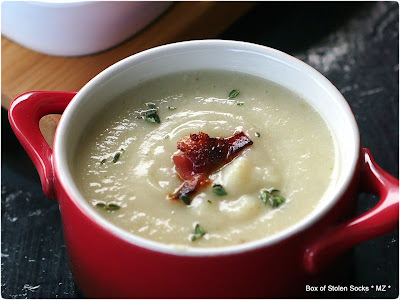 I'm impressed that you got those cauliflower haters to at least try this soup. Some of our recipes are a hard sell, but most are so worth trying. I have several new favorites from the past couple of years with Dorie that I would have never tried without this group. Enjoyed your post. Bacon was definitely needed in my house to get the boys to try it. They all liked it, though some more than others. Ha, Ha I must admit that the bacon did make the difference! Especially the second day when the smokiness of its flavour infused the soup with a lovely taste! Everything does taste better with bacon. Glad that the family relented and tried it. It was good! This looks delish! I don't really know how to cook, but this doesn't look too difficult. Now I have something to surprise my boyfriend with ;) Thanks for sharing! Your soup looks so cute in that little cocotte! 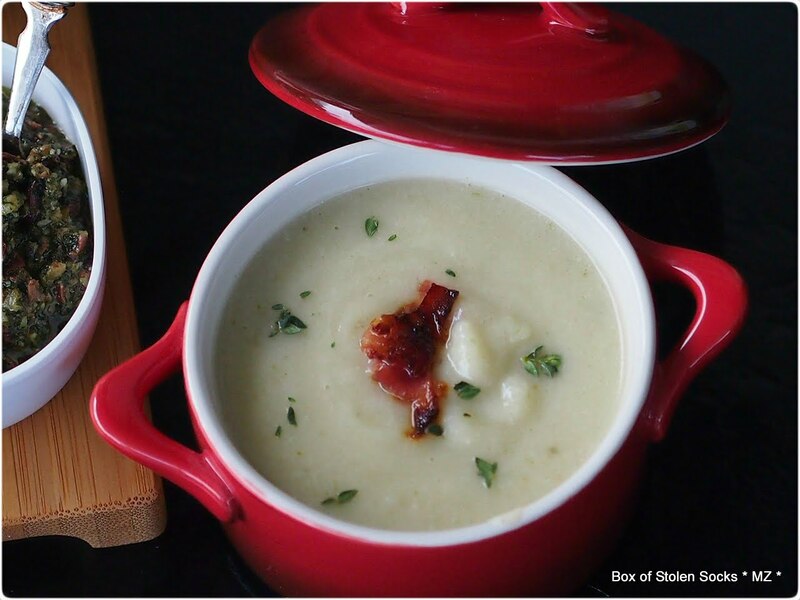 Sounds like it was a hard-won battle in the kitchen but I think you won because your soup looks great! Cauliflower is a favourite of mine, too. In my student days, I used to aggravate my cauliflower-hating roommates by steaming a whole cauliflower, seasoning it with lemon and pepper, and having that as dinner. I'm a little more sophisticated than that now, most of the time. Your soup looks lovely against the red of the bowl.